When I read that title to my husband, he rolled his eyes at me. Poor guy. He went to the emergency room early Tuesday morning with severe pain only to have it confirmed: he had a kidney stone. The 5mm stone was the largest they allowed in order to return home, so he is now drinking quarts of water a day trying to flush the thing out. And that’s basically all you can do. I’ve never had a kidney stone, but I’ve had gallstones so bad that I developed blood poisoning and can vouch for how painful they are. (My gallbladder was so high in my body that my doctors kept telling me it was acid reflux, which is why I ended up with blood poisoning.) I passed maybe a dozen of those things, ending up with one to three days of constant pain each time, and I know my husband’s pain has to be similar or worse. The ER gave him a ‘script for twenty pills, which lasted three days. Guess how long the average person takes to pass a kidney stone? One to three weeks. Yeah, that wasn’t a great length of painkiller for sure. And when my otherwise normally quite healthy hubby called his former doctor to renew the prescription like he was instructed, we learned that his old doctor had actually moved away, and that since her partner had never officially seen him—he hasn’t been to a doctor since 2007—she couldn’t write him one. And she could not see him until next Thursday! I guess he’s just supposed to writhe in pain—the most pain I’ve ever seen him in during our 17 years together—for another six days. Ugh. 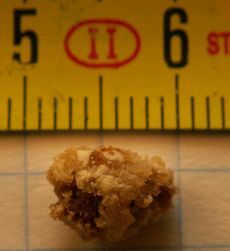 Read more about Got kidney stones?